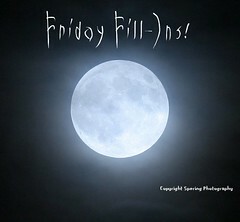 Is it full moon yet? Ooh yeah, two nights ago it was. I wasn't able to view by my naked eye but a friend showed it to me by her photos. :-) I just can remember when I was still in the Philippines, we will go playing at night during full moon by a group or the family and neighbors. Having "libun-libon" or a group games. It was fun! Reminiscing here.. huhu. A glimpse from the past. And so, Friday Filling-Ins is here..
1. One of my favorite birthday present was a new dress (too bad it's only sometimes I can have it before, haha!). 2. Ooh well, it was as simple as that. 3. The moon is as bright as your eyes, haha! Just kidding. 4. Birthday party should have decorations which includes flowers and balloons. 5. I was tempted by that chocolates and your lies. Oops. 6. Swimming, strolling and taking shots are some of the things I like to do on vacation. 7. And as for the weekend, tonight I'm looking forward to do what has to be done, tomorrow my plans include relaxing or just being lazy and Sunday, I want to attend my baby shower, haha! Oops you are all invited! We are just few and I hope you can come.